In a truly fair society, no woman or girl would be at risk of Female Genital Mutilation (FGM). It is gender-based violence – it is unacceptable and it needs to stop. But over 60,000 girls in the UK are vulnerable. That’s why I recently held a conference for North London professionals to discuss working together to end FGM. As you can see, over 100 health workers, social workers, teachers, police and community group representatives gathered at Hornsey School for Girls. It was a great event – with sessions for each sector, mixed sessions to discuss an integrated approach to tackling FGM, speeches from survivors and a presentation from students. There is still a lot of work to do to raise awareness and to protect vulnerable girls. But conferences and conversations like this are important steps in the right direction. 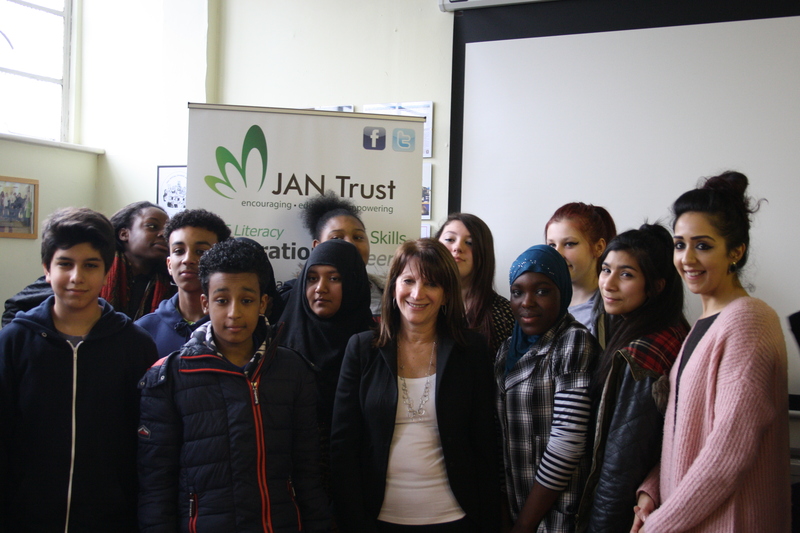 Lynne Featherstone MP last Thursday joined in with the Jan Trust’s Community Champions Day. The Trust – who are based in Lynne Featherstone MP’s constituency – held the day as part of their ‘Against FGM’ project. During the visit, the local MP joined a roundtable discussion on how to raise awareness of FGM, and watched a number of presentations by the community champions. In Government, the Liberal Democrat MP has launched a £35 million programme to support the African-led movement to end FGM. She has also announced mandatory reporting of FGM for frontline professionals. The MP for Hornsey and Wood Green also recently held a local conference – attended by over 100 North London professionals – on working together to end FGM. “Four years ago, very few people had heard of FGM. Now, thanks to the work of brave campaigners, it is very much on the agenda. So many people are working hard to raise awareness and end the unacceptable practice for good. “We’re really leading the way here in Haringey. It was great to have Jan Trust staff at my local FGM conference, and to attend their community champion project just two days later. The conference, which took place at Hornsey School for Girls, was attended by over 100 health, social care, education, police and community professionals from across north London. The conference was opened by Lynne Featherstone MP, and included speeches from campaigners Nimco Ali and Alimatu Dimonekene. During the opening session, students from Hornsey School for Girls presented a dramatic piece. Throughout the day, the attendees were split into smaller groups. They discussed the work already being done to end FGM, and how the different sectors could work together to spot warning signs and protect girls. While a minister at the Department for International Development, Lynne Featherstone announced a £35 million programme to support the African-led movement for change. As Minister of State for Crime Prevention, the Lib Dem MP recently announced that frontline professionals will have a mandatory duty to report cases of FGM. “FGM is an unacceptable practice. In a truly fair society, where everyone has equal opportunity to get on, FGM would not happen. That’s why we have to keep working together and raising awareness until the day when no girl is at risk of FGM. “Thanks to brave campaigners like Nimco and Alimatu, ending FGM is now very much on the agenda. As a Minister for Development and now Crime Prevention, I have worked with them and my team in Government to launch a £35 million programme to support the movement to end FGM, and more recently, to announce mandatory reporting. “And of course, I want to tackle FGM and protect girls locally, too. That’s why I put together the conference – and it was fantastic to see professionals from across North London come together to discuss how to work together to prevent FGM. Health workers, social workers, police, teachers and community groups will get together at the conference – which is being held at Hornsey School for Girls on Tuesday 17th February. There will be a number of sessions for professional to discuss how they can best work together to prevent FGM and support local girls. The conference will be opened by Lynne Featherstone MP, and will also include speeches by prominent FGM campaigners Nimco Ali and Alimatu Dimonekene. The MP for Hornsey and Wood Green is also the Minister for Crime Prevention at the Home Office. The Lib Dem MP previously held a position at DFID, where she announced a £35 million programme to help end FGM within a generation. There are a small number of spaces still available for the conference, which can be booked by contacting the Liberal Democrat MP. “In a truly fair and equal society – no girl would be at risk of undergoing FGM. That’s why I will continue to raise awareness and campaign for better support and protection for girls until FGM is no longer practised at all. “This conference will bring together different professionals, campaigners and survivors from across North London, and will start conversations about how working together can benefit local girls who may be at risk. We spend a lot of time blaming men (not without reason) for violence against women and girls – but they can be agents of change. The coalition government is determined to tackle violence against women and girls in all its forms. These abhorrent crimes are not a women’s issue – they are everyone’s issue. And men can be central to bringing about cultural change. In December last year, we re-launched the This is Abuse campaign which aims to prevent teenagers from becoming victims and perpetrators of abuse, encourage them to consider their views of abuse and the meaning of consent within relationships and signpost them to help and advice. A significant focus of the campaign is targeted at boys and young men to help them identify and challenge abusive behaviour. Just Google ‘this is abuse’ and you will see the campaigns from the Home Office. They are really potent. A while back I went into Channing School to talk to the sixth form and I asked who in the class had seen the This is Abuse campaign – and nearly the whole class had. It really reaches out to young people negotiating the difficult territory of relationships and what is ok and what is not. The White Ribbon Campaign (WRC) – which I wrote about yesterday – appeared in 1991 and has become one of the largest men’s anti-violence programs in the world. It has now spread to over 57 countries around the world.